Yoga is an amazing way to stay healthy, but it can start to feel a little samey, especially if you’ve been practicing for a while. So, what if you could take your yoga practice to the water? Well, with yoga paddle boarding, you can do just that. Whichever location you choose, you’re sure to have a memorable experience. Enjoying the fresh air, the motion of the water beneath you, and the sounds of nature all around will make a big change from gym music. You might feel a stronger sense of connection or a greater focus. You’ll also be testing your balance and adding an element of challenge to your routine, which is ideal if things feel too easy. 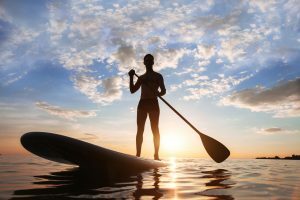 So, which poses are best for yoga paddle boarding? 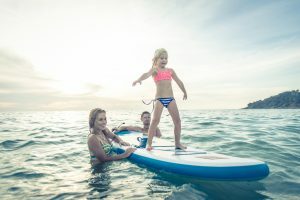 Experimenting with your regular poses can be fun, but I’ve got five poses you absolutely have to try on your paddle board. These poses will challenge you but provide enough stability to prevent frustration. This energizing pose might sound a little complicated, but it’s easy once you know how. Sit on your yoga paddle board, with your legs stretched out in front of you. 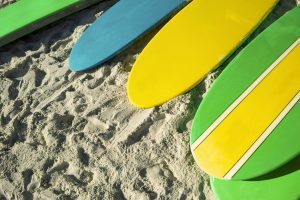 Bend your knees, keeping your feet on the board, and slide your left foot under your right leg, laying the side of your right leg on the board. Step your right foot over your right leg, and keep it flat on the board, outside your left hip. Exhale fully, and twist to your right. Put your right hand on the board behind you, and place your right arm against your right thigh, with the palm facing away from you. Press your right foot into the board and stretch your torso, leaning back slightly and lengthening your tailbone. Turn your head to the left, and look over your left shoulder. Hold the twist for 30 seconds, then exhale and release. Repeat the movement in the opposite direction. We’ve got another nautical sounding pose for you here. The boat pose is a great workout for your abs and hips, and shouldn’t be too hard for beginners to get the hang of. 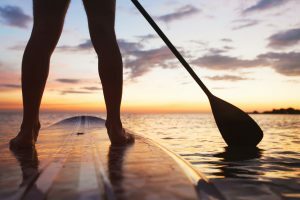 Sit on your yoga paddle board with your legs out in front of you. Place your hands flat on the yoga paddle board, just behind your hips. Push up through your arms, leaning your torso back slightly. Exhale, and bend your knees. Lift your feet up at a 45-degree angle to the board, and straighten your knees if possible. If that’s too tricky, keep your knees bent and stretch your legs as far as is comfortable. Stretch your arms out in front of you, parallel to the board. If you’re having trouble, try holding onto the back of your thighs instead. Hold the pose for 10 – 20 seconds, and gradually increase your hold time up to one minute. This is one of the most popular yoga poses and comes with lots of benefits, so chances are you’re familiar with it. This is a great pose to slot between more complex, challenging movements. Kneel on your board, with your hands flat in front of you, about a hip width apart. Exhale, and lift your knees away from the board. Lengthen your tailbone, and lift your sit bones up towards the sky. Exhale, and push your thighs back, stretching your heels down onto the board. Keep your knees straight without locking them. Press your hands into the board. Lift your arms, keeping your head between your arms. Stay in the pose for up to three minutes, but don’t worry if you can’t hold it for that long. Focus on balance, slow movements, and measured breathing. You probably won’t find any camels while you’re in the water, but the camel pose is a great one to practice on your yoga paddle board. Kneel on your board with your knees hip width apart. Push your hips slightly inward and firm your buttocks, drawing your sitting bones upwards. 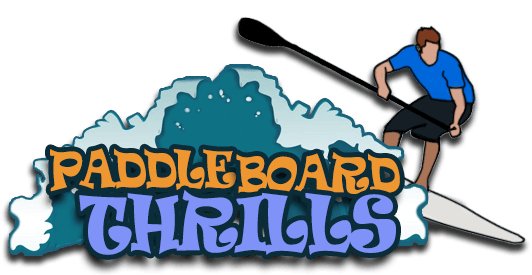 Place your hands at the back of your pelvis with the fingers pointing towards your board. Inhale and lift your heart, pressing your shoulder blades together. Lean back gently, and aim to touch your hands to your feet. If that’s tricky, tilt your thighs back slowly and gently. Lift your ribs away from your pelvis and keep your spine long. Press your palms against your heels, with fingers pointing down towards your board. Stay in this pose for 30 seconds, then exhale, bring your hands to your hips, and lift your head up to release. This is a fun pose which presents a welcome challenge when using a yoga paddle board. You’ll bend your body into the shape of a bow, stretching fully and infusing your body with energy. Lay flat on your belly on your yoga paddle board, with your hands beside your torso. Exhale and bend your knees, bringing your heels to your buttocks if you can. Take hold of your ankles with your hands, keeping your knees a hip width apart. Inhale, lifting your thighs off the board and your ankles away from your buttocks. You’ll notice that your head and torso lift at the same time, pulling your body into a bow shape. Press your shoulder blades against your back and look straight ahead. Hold this pose for 20 – 30 seconds, breathing deeply, then release and lie down to rest for several breaths. 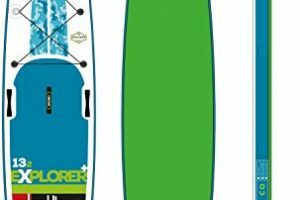 Ready to Try Out A Yoga Paddle Board? 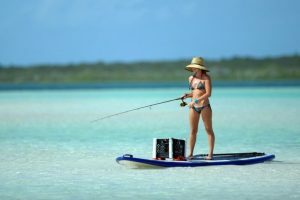 Paddle boarding is fun, yoga is fun… so what’s not to love about yoga paddle boarding? It’s a great form of exercise, a wonderful way to enjoy time in nature, and a nice change from the usual routine. 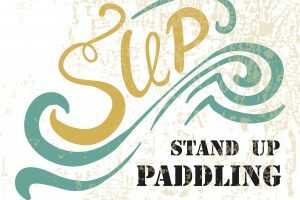 Grab a yoga paddle board and try it once, and you’ll soon be back for more.